The Hanseatic City Challenge was part of the 37th edition of the ‘International Hanseatic Days’ held in Kampen, the Netherlands from 15 to 18 June 2017. The challenge’s central question was: how can we protect our Hanseatic cities from the consequences of climate change? The winning idea was an entry from team Groningen (Groningen municipality, University of Applied Sciences and VITENS). 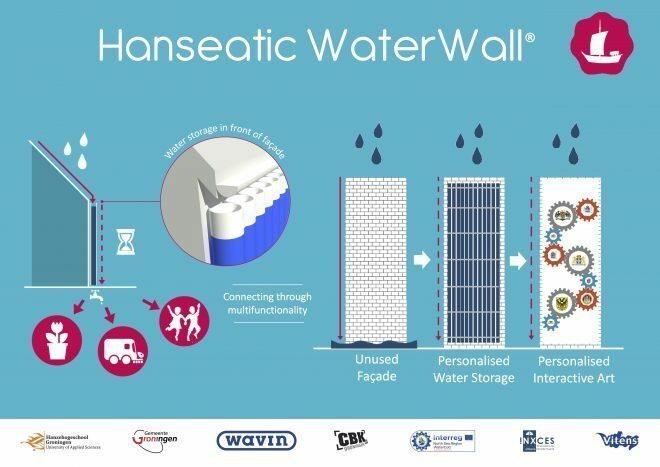 This innovative idea, ‘Hanseatic WaterWall’, is in fact an additional building facade layer that catches rain water, releasing it again under controlled conditions. It’s also possible to store the water for a short period to use for irrigating plants or cleaning plazas, for example.